WHAT'S NEW AT G.S. GELATO? Every year, Inc. Magazine compiles applications from tens of thousands of companies for the chance to be named one of America’s fastest-growing private companies. While only a fraction makes the list, even fewer, 1 in 5 to be exact, make this list three times in a row, making G.S. Gelato’s third year Inc 5000 ranking a truly extraordinary achievement. Making the list gets harder every year as the starting base of a company grows. While the economy grew only 6.7% during the last three years, G.S. Gelato enjoyed over 50% growth since 2013. Since moving from Italy to the United States over twenty years ago, G.S. 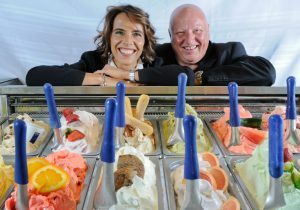 Gelato’s owners Guido and Simona have not enjoyed this growth by luck. Hard work, perseverance, determination and a unique passion for bringing authentic Italian gelato to America was the driving force behind their success. G.S. Gelato’s third year Inc. 5000 ranking is due to those very solid pillars of success, along with innovation in flavors and packaging, as well as unparalleled support and customization for G.S. Gelato’s foodservice and retail customers. In a rapidly evolving market, staying on top of new trends and standards is of utmost importance to continued growth, for both the company and their clients. Offering a variety of new products, like their new clean label pints for store brands and wholesale clubs, and “smart snack” mini cups for hospitals and schools keeps G.S. Gelato at the forefront of the market as the leader in foodservice and retail private label gelato manufacturing.